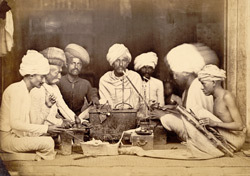 Photograph of a group of goldsmiths (Sonars) seated round a low work table at Bombay in Maharashtra, taken by Shivashanker Narayen in c. 1873, from the Archaeological Survey of India Collections. This image was probably shown at the Vienna Exhibition of 1873. In the catalogue of the Vienna exhibition John Forbes Watson writes: "The Sonar or gold and silversmith is an indispensable member of the Indian social condition of life; and he is to be found in every village, almost in every hamlet, as well as in all towns and cities. In the Deccan, where original national institutions are preserved in village communes, and wherever they are at present existent throughout India - the Sonar is a member of the hereditary village council, which includes the carpenter and blacksmith, the potter, and other useful and indispensable mechanics, and is twelve in number, presided over by the patell, the hereditary magistrate or head manager." This is one of a series of photographs commissioned by the Government of India in the 19th century, in order to gather information about the different racial groups on the sub-continent.